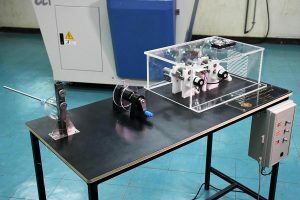 A team of students from RMUTT’s Department of Textile Engineering in the Faculty of Engineering came up with a world-changing idea to develop a ‘machine to cut bottles and stretch them to make yarn’, transforming waste plastic bottles into yarn in order to produce textile products. 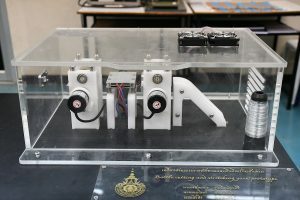 The machine was created by Mr. Ekawit Saitubtim, Mr. Siratee Puangyam, and Mr. Pattanakorn Rungruangkraisiri. The starting point of this machine was due to a problem pertaining to waste from water bottles that are made of plastic or PET bottles. There is currently an increasing amount of plastic bottles and each bottle takes more than 450 years to dissolve. However, plastic bottles can be melted but will use a copious amount of energy and adversely affect both humans and the environment. Hence, the students aim to convert plastic waste into yarn and knit them into textile products. Dr. Bintasan Kwankhao and Acting Sub Lt. Siriwan Sritamarong were the advisors of this project. Furthermore, the machine to cut bottles and stretch them to make yarn has two main processes: the first process involves cutting bottles with a blade to create a thick and flat yarn. Then, the yarn is collected and stretched by using heat to shape the edges so the yarn becomes smaller, much like a tendon. Afterwards, a motor is used to drive the yarn through a heat pad and the final process results in a small yarn that is long and round, which is suitable for being knitted and woven into home textile products such as fabric for furniture, placemats, and curtains for decoration, among other uses. 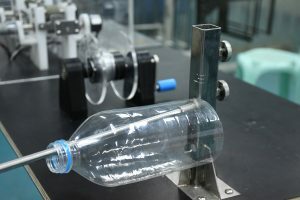 Using the prototype machine to cut bottles and stretch them into yarn begins by using clear plastic bottles that are smooth and do not have edges or patterns. The clear plastic bottles are cut into approximately 1 – 1.5 inches and the edges of the bottles are cut at a distance of 2 millimeters. The plastic bottles are put into the machine so the ends of the yarn pass through the machine. The ends of the yarn that have passed through the machine will be coiled to pull the flat yarns out, then the flat yarns goes through the stretching process and is coiled and collected in a tube to be used as materials for making textile products. “From experimenting with a prototype weaving machine by using yarn made from plastic as weft and using acrylic yarn as warp – it was found that they can be made into textile products. 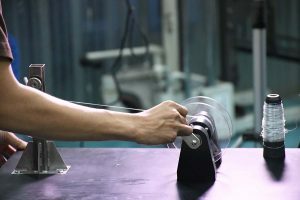 The properties of the yarn are also strong, relatively durable, and suitable for producing home textile products” said a student from the project team. 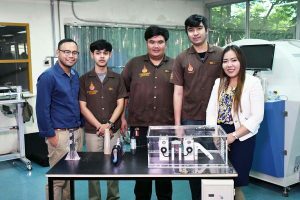 Moreover, Dr. Bintasan Kwankhao summarized that the yarn made from plastic bottles, produced by the prototype machine creates value to excess plastic bottle waste that is used on a daily basis. Plastic bottle waste is reused and helps reduce the amount of waste by using innovative knowledge and technology to produce creative textile products. In the future, this prototype machine can be scaled up and used for commercials purposes. Additionally, Acting Sub Lt. Siriwan Sritamarong said that sample products made from the yarn can be used in real life and are functional. The yarn is robust and is similar to a tendon, is considered a feasible way to reduce the use of plastic bottles, and is environmentally friendly. Those that are interested may contact RMUTT’s Department of Textile Engineering directly by calling 086-372-2269 or 089-257-1726.